Are you thinking about getting out? Are you dating another person? Are you staying in your marriage for the kids? 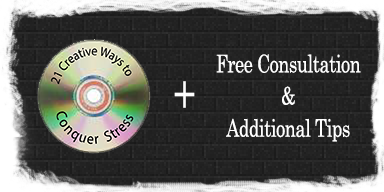 3 CD program includes over three hours of 101 divorce tips. 21 simple techniques for managing stress in every aspect of your life. $30 dollar value, yours FREE. Also included: FREE consultation with Dr. Granat. There are lots of programs on divorce by attorneys. And there are lots of programs by therapists on the same topic. This is one of the only programs that can help with both the legal and psychological issues surrounding divorce. Developed by a prominent divorce lawyer and a psychotherapist, licensed marriage and family therapist, with more than fifty years of combined experience. This program will help you to understand how to protect yourself and your family. Listen in your car, on your phone or at your desk. And in a few hours you will know what you need to do to make a wise decision and take good care of yourself. 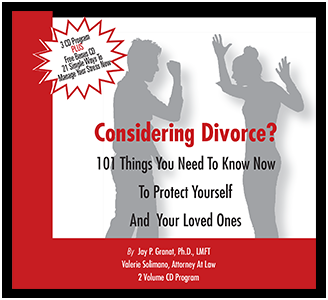 Dr. Jay Granat, Ph.D., LMFT and Valerie Solimano Attorney at Law have carefully considered the questions that their clients and patients ask all the time and have compiled these issues into a 3 volume CD program. How did the authors decide what questions to answer? We carefully considered the questions that our clients and patients ask us all the time and tried to address these issues in this program. 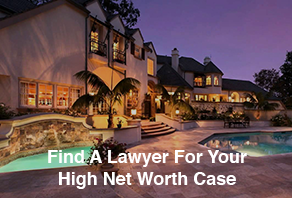 This program can help you to save money on legal fees, as well as time and energy. You will find out what you need to do to speed up the divorce process if you decide you want out. If you are thinking about divorce and have some questions about the legal, financial and emotional issues this important decision. This 3 CD volume program will answer many of your questions. It will give you lots of useful tips to save your marriage, protect yourself, your assets and your kids and show you how to cope with your decision with the least amount of stress. What Should You Do If You Are Trapped In An Abusive Marriage? When Is It Okay To Date? When Is It Time To Change Lawyers? What Causes Relationships To End? Why Will The Number Of Divorces Increase? What Can You Do To Manage The Stress? Learn what to do to survive your divorce legally, emotionally and financially in a timely, kind and effective way. Listen to emotional and legal advice in the comfort of your home or the privacy of your car. And in a few hours you will know what you need to do to make a wise decision and take good care of yourself. Get your life back on track after your divorce is over. Order your 101 Divorce Tips today for the health and well being of all involved - you, your partner and your children. 21 simple techniques for managing stress in every aspect of your life. $30 dollar value, yours FREE. Laws do vary from state to state, so be sure to check with an attorney in your area to find out the best way to protect yourself and your family. One of the first things you need to consider and evaluate when thinking about divorce is your money and your finances, according to many family lawyers. College tuition, health care costs, alimony, child support, your assets, your business, your home and your retirement need to be understood, addressed and protected. Recognize when you and your spouse are fighting over something which, in reality, is quite small and insignificant. Pick and choose your battle carefully and learn to let go of small issues.